A Boeing 777 operated by Asiana Airlines crash landed at SFO. 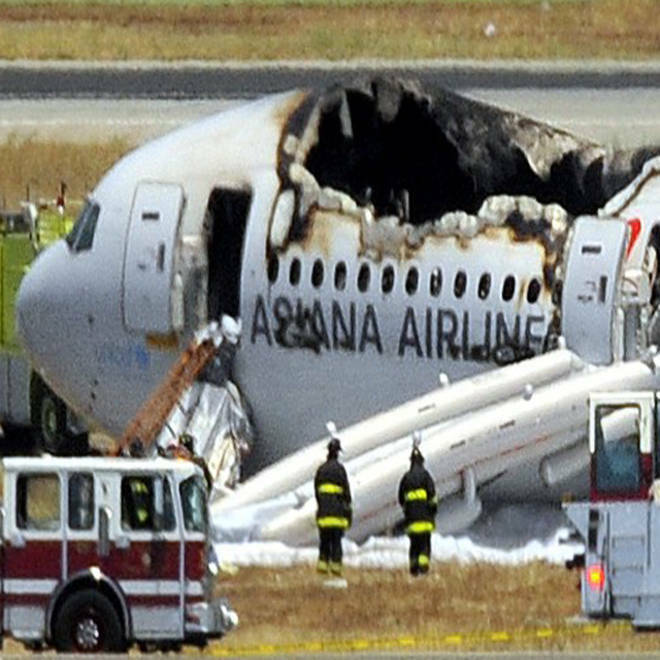 A child who was injured in the Asiana Airlines crash in San Francisco died Friday morning, hospital officials said, bringing the death toll from the accident to three. The unidentified girl had been in critical condition since the crash, according to Rachael Kagan, the chief communications officer for the San Francisco General Hospital and Trauma Center. Roughly 180 other passengers were injured when Flight 214 clipped the seawall on the runway at San Francisco International Airport just before 11:30 a.m. local time Saturday. Sixteen people remained in hospitals Friday evening, including two adults in critical condition. One of the two girls who died at the scene of the horrific crash was run over by a fire truck as first responders rushed to help, but it's unclear whether she was alive or dead when she was struck, a San Francisco Police Department spokesman told NBC News. Medical examiners will not release autopsy results for “at least two or three weeks,” San Mateo County Coroner Robert Foucrault told NBC Bay Area on Sunday. Coroner’s officials are working to determine how 16-year-old Ye Mengyuan died. Wreckage from Asiana flight 214 is being cleared and moved away and they are slated to repaint the runway -- but it will be up to the FAA as to when traffic is allowed on it once again. And as for the Boeing 787 Dreamliner that caught fire at London's Heathrow airport Friday, it appears to have had nothing to do with batteries -- because the fire was on the roof of the plane. NBC's Tom Costello reports. A firefighter first reported to a superior Saturday that a passenger who was on the runway approximately 30 feet from the ravaged jetliner and close to the escape slide may have been crushed by a fire rig as crews began transporting victims to local hospitals, according to the AP. Federal and local officials were informed of the firefighter’s report. The drivers behind the wheels of the first wave of trucks to respond to the horrific scene were administered drug and alcohol tests, which they passed, according to the AP. The victims were reportedly traveling in a group of 34 Chinese high school students and a teacher on their way to summer camp in California, according to NBC Los Angeles. The wreckage of Flight 214 was removed from the runway early Friday (see video below). The runway, 28L, reopened to air traffic at 5:05 p.m. PT Friday, the airport said on its Twitter account.